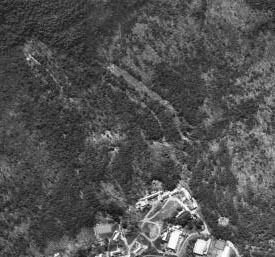 Berkshire School's original ski hill (two trails, the Warner and the Coffin) was actually cleared and a tow was built in the late 1940's. A second hill (Upper Coffin) was built in 1960 and the upper tow added. The length of the two hills was 1800 feet. The average annual snow fall in the south Berkshires does not make for great natural skiing; the best winter we ever had was 44 days of operating the tows. More often than not, we were lucky to get 10 days to 2 weeks. By 1971, Berkshire's two hills were not sophisticated enough; we had no snowmaking capabilities; and the insurance companies wouldn't cover our primitive rope tows, whose wheels were bolted to the trees. 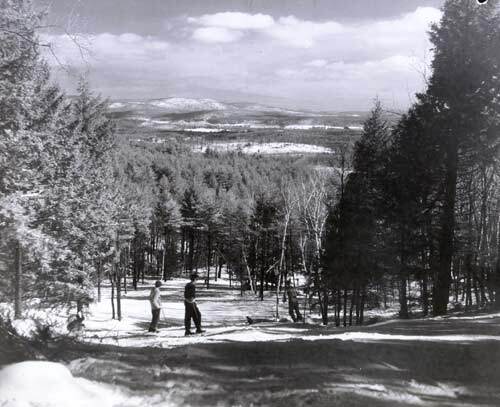 Here's a 1965 picture of the Lower Coffin Trail, from Berkshire School. 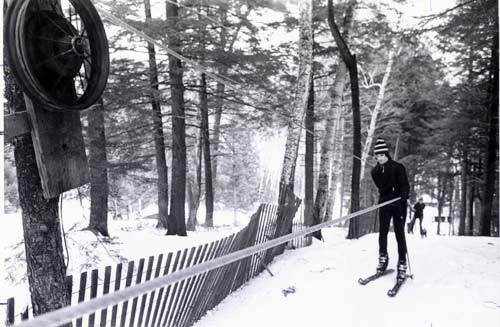 And a 1971 picture of the lower rope tow, from Berkshire School. Gerry Katz: "I attended Berkshire School, in Sheffield, MA. The school had their own ski hill built and maintained by the school with one or two rope tows. I started there in the fall of 1972 and the tow was no longer in operation, though we still used the hill for dry land training and snurfing. Tow must have been put out of operation the previous year as it was still possible to use the hill. Graduated in 1975. Recent visits found the hill fully reclaimed by trees. The school also had a Nordic ski jump at one time on another part of the campus." J. Tanner: "This ski area was the ski slopes for a private school in Western MA called the Berkshire School in Sheffield MA. They had cut what I believe was three trails and installed a rope tow. The school has tons of photos of the ski team racing from way back. The hill was closed due to lack of snow and the team know races at Catamount. The proud racing tradition lives on at Berkshire and the team has won their league in Western MA 22 years in a row!! !